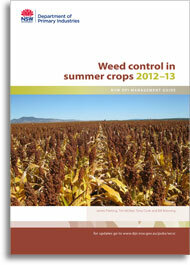 Good weed control management in summer crops is essential for the production of high-yielding and profitable crops. Weeds lower crop yields by competing for soil water, nutrients, space and light. In dryland crops where water is often severely limited, competition for water is the most critical factor in reducing yields. For irrigated crops, competition for light and nutrients is more important. Growers should aim to reduce weed numbers and keep them low with an ongoing control program. Management practices that combine all of the available methods are the key to successful weed control.